Kirby and I will fight anyone that dares suggest the Nintendo GameCube didn’t introduce one of the best controller designs of all time. Countless Super Smash Bros. devotees agree with that sentiment, which is why Nintendo has even re-released it. 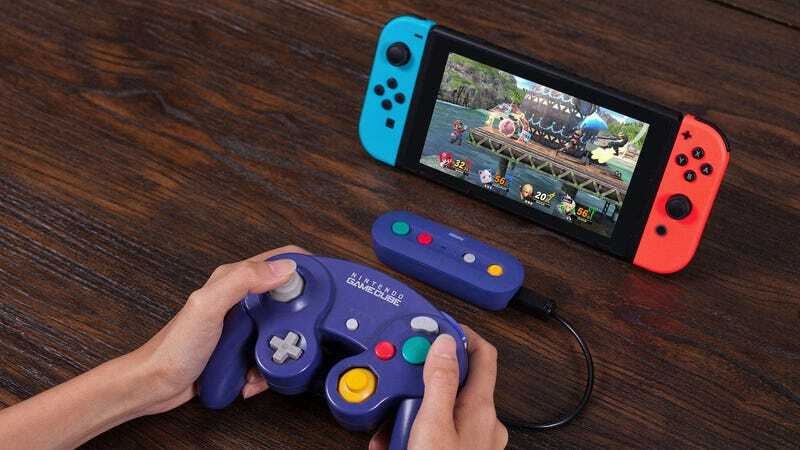 But it’s 8Bitdo that’s created the best way to actually use a classic GameCube controller with your Switch. If you can’t find your original GameCube hardware ahead of Super Smash Bros. Ultimate’s release on December 7, and refuse to play the game with anything else, Nintendo will happily sell you a corded replacement for just $30. However, in order to connect it to your port-less Switch, you’ll need to also buy a $20 four-port GameCube adapter from Nintendo, which can only be used while your Switch is docked in TV mode, which negates the console’s portability. 8Bitdo’s new GBros. adapter, which also sells for $20, appears to be a better solution for playing Super Smash Bros. Ultimate with your old GameCube hardware. Using a Bluetooth connection, it allows the controller to be used with the Switch in portable or docked mode, and with the latter configuration, where your Switch is on the other side of the room next to your TV, the GBros. adapter includes additional home and screenshot buttons so you can still easily navigate the console’s UI. The GBros. adapter also works with the wired controllers included with the tiny NES and SNES Classic Edition consoles. If you’re also intro retro gaming on the Switch, the GBros. includes two ports so in addition to connecting a GameCube controller, it also works with the Wii’s Classic Controller, and the tethered NES and SNESgamepads designed for use with Nintendo’s miniature all-in-one throwback consoles. It unfortunately won’t work with the original controllers from either of those classic systems, but upgrading those with wireless capabilities is now trivial. Lastly, the adapter can also be toggled into a standard Bluetooth controller mode for use with emulators on a computer running Windows. Anti-money Laundering Software Market 2018: Technological Advancements, Current and Future Scenario Of The Market . . The GBros. adapter includes a copy of the Switch’s home button, screenshot button, and a switch for toggling between Nintendo and Windows modes. The 8Bitdo GBros. wireless adapter isn’t the perfect solution, however. Nintendo’s tethered adapter is the same price, and it allows up to four GameCube controllers to be connected to the Switch with just the one adapter. If you intend to play Super Smash Bros. Ultimate with three other friends all huddled around the same screen (as it’s intended to be played) going the wireless GBros. route will cost you $80—unless you can convince everyone to buy and bring their own hardware. Civilization VI Runs Well On Switch But Is Missing Some Features . . .